Adult city residents will pay $8 for a daily visit, $170 for a multi-visit pass, $37 for an individual monthly access pass or $370 for an annual pass. For a non-resident, those costs are $11, $247, $49 and $490, respectively. A city family of four can pay $88 to have a monthly access pass or $880 for an annual one; and a non-city family of four would be charged $118 for a monthly pass or $1,180 for an annual pass. ↑ 1.0 1.1 1.2 Web. , Rachana Dixit, Daily Progress, World Media Enterprises, October 19, 2010, retrieved October 19, 2010. ↑ Web. Charlottesville - Smith Aquatic and Fitness Center, City of Charlottesville, retrieved September 14, 2010. ↑ Web. 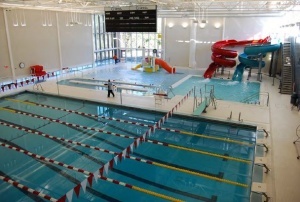 2011 Facility of Merit Winner: Smith Aquatic & Fitness Center, Buford Middle School, Athletic Business Magazine, October 11, 2011, retrieved October 17, 2011. ↑ Web. Charlottesville Parks and Recreation Update for City Council, May 2013, Brian Daly, City of Charlottesville, retrieved May 10, 2013. ↑ Web. Smith Aquatic Center Becomes Platinum LEED Certified, Ric Barrick, City of Charlottesville, October 4, 2011, retrieved October 6, 2011. ↑ Web. City's Smith center honored, Daily Progress Staff Reports, Daily Progress, World Media Enterprises, October 15, 2011, retrieved October 17, 2011. This page was last edited on 10 April 2019, at 12:06.